DULLES, Va.Apr. 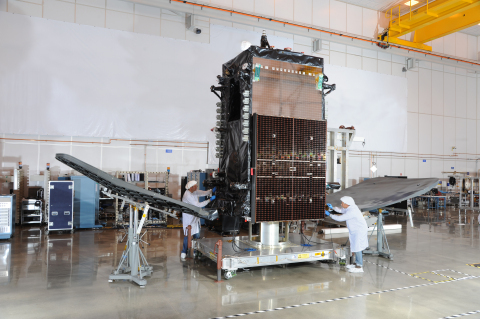 17, 2015-- Orbital ATK, Inc. (NYSE: OA), a global leader in aerospace and defense technologies, today announced it delivered the SKY MEXICO-1 (SKYM-1) satellite to the launch site in Kourou, French Guiana for its DIRECTV customer. The SKYM-1 satellite, due to launch in late May, will provide direct-to-home television broadcast services to Mexico, Central America and the Caribbean for DIRECTV. The company produced the satellite at its Dulles, Virginia manufacturing facility in just 20 months, four months ahead of the original baseline schedule. The SKYM-1 satellite, which is based on the flight-proven GEOStar-2TM platform, will now undergo pre-launch preparations for a late May launch aboard an Ariane 5 rocket. Our ability to deliver this satellite well ahead of schedule demonstrates the effective, experienced performance of our Orbital ATK team. We take great pride in the short cycle manufacturing process that results in high quality and reliable satellites for our customers, said Chris Richmond, Vice President and General Manager of Orbital ATK s commercial satellite division. SKYM-1 is our first satellite built for DIRECTV and represents what we hope will be the start of a longstanding, successful relationship.